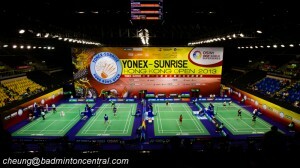 The long-standing rivarly once again set up in men’s singles semifinal today, Lin Dan v Lee Chong Wei. These two prominent players, Lin and Lee needed to work hard to overcome their quarterfinal opponents, Hu Yun and Jorgensen respectively. Lin is struggling to awe badminton fans at several Superseries lately and Lee starts to regain confidence after grabbing the French Open title in Paris last month. Twice world champion Chen Long will take on familiar foe, Son Wan Ho who’s trying to find his best form. Home favourite Chen eliminated Danish rising star Viktor Axelsen in high quality match yesterday while Son was forced to dig deep before disposed of local promising youngster Shi Yuqi. The Chinese trio roar at homesoil to knock out their rival and it’s the first time they marched together into last four in this year top tier tournament. The most notable victory was created by Wang Shixian to thwart strong favourite Carolina Marin; she scored 10 consecutive points decider and pushed Marin had no answer to counter attack. Wang Yihan and Li Xuerui also bring China women’s singles back to business. The only non Chinese player left in this category is defending champion Saina Nehwal who will face her nemesis Wang Yihan. Korea men’s doubles still shows strong presence without Lee YD/Yoo YS as Ko Sung Hyun/Shin Baek Cheol and Kim Gi Jung/Kim Sa Rang advanced to semifinal. Former world champion Ko/Shin dumped giant-killer Li JH/Liu YC and will be up against China’s last hope in this discipline, Chai Biao/Hong Wei. The two Kims will take on Japan top-ranked pair Hiroyuki Endo/Kenichi Hayakawa. World number one’s Misaki Matsutomo/Ayaka Takahashi have have to dispose of Korean women’s doubles pair Chang Ye Na/Lee So Hee to book a final’s ticket. The Japanese pair have failed to clear the second round in last four Superseries tournaments after pretty strong start in early this year. Chang/Lee outwitted Pedersen/Juhl yesterday and it is not impossible for this Korean ladies to cruise into the final. At bottom half of draw, the Olympic and world champion Tian Qing/Zhao Yunlei will up against recent Bitburger Open winner Tang Yuanting/Yu Yang. Joachim Fischer Nielsen/Christinna Pedersen are surrounded by three home pairs. Their semifinal opponent is current World Championships silver medalist Liu Cheng/Bao Yixin who lost to the Danes at their last meeting in the Japan Open last September. At top half of draw, Zhang Nan/Zhao Yunlei will be up against their compatriots Xu Chen/Ma Jin to defend the title here. The mighty Zhang/Zhao almost tasted defeat yesterday when Indonesian Jordan/Susanto led with big margin at deciding game.